Salmon producers in the northern isles say they are confident 2019 could be the first year in the industry’s 40-year history that no seals will be shot in Shetland as multi-million pound investments into anti-predator nets begin to show positive results. When tourists discovered five shot seals on the coastline at Basta Voe, in Yell, last summer, environmental campaigners renewed their calls to outlaw the shooting of seals in Scotland. Every year government agency Marine Scotland grants more than 40 licences to salmon farming companies allowing them to shoot seals to protect their stock and gear resulting in 73 seals being shot in Scotland in 2017. Latest figures complied by the salmon farming industry show that last year (2018) 13 seals were shot in Shetland, eight by Cooke Aquaculture, five by Scottish Sea Farms and none by Grieg Seafood. 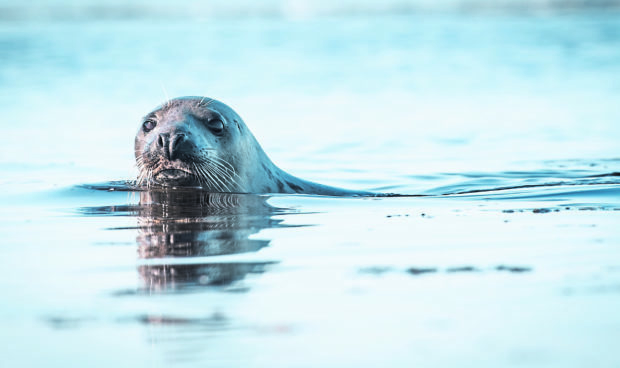 Following an investigation by Marine Scotland, Cooke Aquaculture was fined £2,000 for failing to report the killing of seals in Basta Voe to the licencing authority within 48 hours. Cooke farm manager David Brown said the company was in the process of investing a total of £4.7 million into anti-predator nets. Mr Brown said the company has had no issues with seals in the 140 cages so far fitted with the new netting, and expects the number of seals shot on their farms to drop to zero once all the company’s salmon farms are equipped with the new anti-predator netting by the end of 2019. The shift in the industry’s attitude has been welcomed by local conservationists. Hillswick Wildlife Sanctuary co-owner Pete Bevington said: “We are glad that this is now taking place. What we really hope is that this sets some kind of precedent for the salmon industry elsewhere.